One of my favorite Greek dishes is Moussaka. I can eat it every day of the week and still not get sick of it. To make a paleo version, I took out the potatoes and replaced them with mushrooms. I also took out the flour in the top bechamel layer. 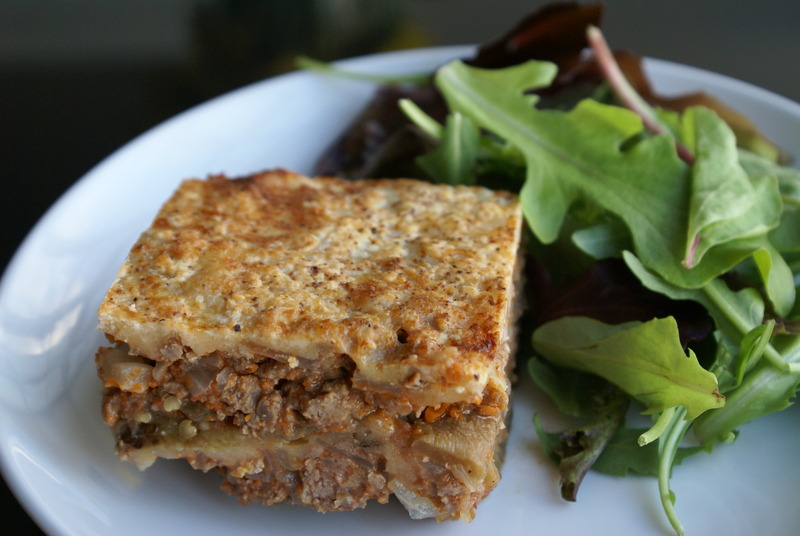 It doesn’t taste exactly like Moussaka but it does serve as an awesome paleo meat lasagna. This recipe also includes cheese because I’m a lacto-paleo cavewoman. I love cheese way too much to take it out of my diet. My husband is 100% paleo now and I’ve made a version of this without cheese that was really delicious. To each caveman their own I say! Lay the slices of eggplant on paper towels, sprinkle lightly with salt, and set aside for 20 minutes to draw out the moisture. Then in a skillet over high heat, heat 1 tablespoon of olive oil. Fry the eggplant until browned (about 3-5 minutes per side). My skillet is quite small so it took about 4 rounds of this for me to finish all of the eggplant. Once finished – set aside on paper towels to drain. In a large skillet on high heat, add a tablespoon of olive oil and add the ground beef, salt and pepper to taste, onions, and garlic. After the beef is browned, sprinkle in the cinnamon, nutmeg and herbs. Pour in the tomato sauce and wine, and mix well. Lower heat and simmer for 20 minutes. After 20 minutes, set aside in a large bowl to let the meat cool a bit. After 10-15 minutes stir in a beaten egg (I find this makes the lasagna less liquid-y). While the beef is cooking, sautee your mushrooms until lightly browned (about 10 minutes) on medium heat with a little bit of olive oil. Constantly stir your mushrooms so they cook evenly. Set aside to cool. To make the last layer of your lasagna, melt 4 tablespoons of butter in the microwave or in a saucepan. Add roughly 2 oz of parmesan cheese, ground nutmeg and beaten egg. Set mixture aside. Now we’re ready to do the layering! Grease a 9×12 inch baking dish and layer the bottom of the pan with the cooked eggplant. You’ll find that the eggplant will be a bit soft and difficult to layer. But that’s ok – it’s not going to win America’s Next Top Model. Just treat the eggplant like a lady – nice and delicate. Then spoon in the meat mixture to completely cover the eggplant. Then add 7 oz of grated cheese and then the sautéed mushrooms. Repeat again with another layer of eggplant, meat, mushroom layers and cheese as your top layer. I was only able to do 2 layers of each with these ingredients. It seemed to work perfectly in a 9×12 pan. Once you’re done with all of the layering, spread the béchamel sauce on top (use a spoon to evenly pour it on the lasagna). Now you’re ready to bake! Bake in the oven for 60-70 minutes. If you serve it immediately it will be quite liquid-y. But if you let it cool for 15-20 minutes, it should set nicely and be a bit more dry. I still have to take some paper towels to reduce the oily-top. This recipe is a lot of hard work but I promise it’s worth it. My husband absolutely loved it. Serve and enjoy! Preheat your oven to 400 degrees. Place the cubed squash on an oven safe tray and add some fresh ground pepper. Bake until soft (30 minutes). Once they are tender, mash together with a fork (or masher) and set aside. To prepare the crust – get a medium sized bowl – add your flours and egg together. Hand mix until you have a dough-like consistency. (It will be a bit tougher/harder than your typical dough but that’s expected – you’re using nut flours!). Place the dough on a large piece of parchment paper. Get your rolling pin out and roll the dough until the crust is about 1/8″ thick. Place in oven and bake at 400 degrees for 5-10 minutes. Set aside. While you are baking your squash (and your pizza crust for a little bit), peel and slice your onions. I like to cut my onions very thin but slice to your desired width. Heat a large saucepan on medium heat and coat the pan with around 3 tablespoons of olive oil. Once the pan is heated – add your onions and stir frequently for 10 minutes and then lower the heat. Let cook for 25-30 minutes, stirring occasionally. The onions take the longest time. But once they are ready – you’re almost set! 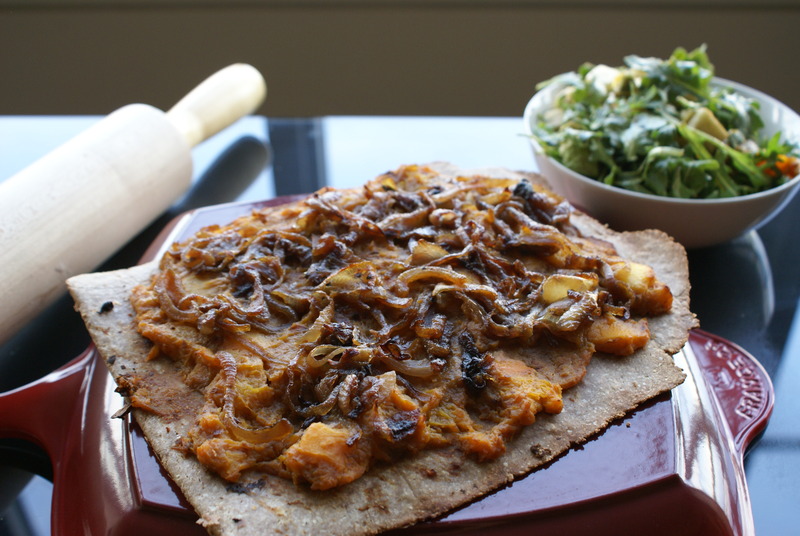 Take your crust and spread the squash puree on top. Then add the onions. Bake in the oven for 5-7 minutes at 400 degrees. Let cool for a few minutes and then serve!! I have a feeling I’ll be making different versions of this pizza to perfect the seasoning and flavors. Let me know of any good combos you try! This is my go to paleo meal when I want something really filling and delicious but have very little time. Rachel Ray would be happy to know this is definitely a 30 minutes or less kind of meal. Even my non-paleo friends (Ben and Joanna – let’s call them Ben-anna) enjoyed it. I actually like this with quartered bell peppers. You can use lettuce as the wrap as well but I really encourage you to try it with colored bell peppers. They have a great natural sweet taste, a nice crunch and a perfect way to get more veggies in without even trying! This is one of my favorite paleo recipes and I’ve made it a dozen times but just keep forgetting to post. Hope you enjoy! Heat saucepan on high with extra virgin olive oil. Once the pan is heated, add the ground pork, mushrooms and onion. Stir frequently until the ground pork is lightly brown. Then add the shrimp, ginger, garlic and onions. Stir until the shrimp is a nice pink color and fully cooked. Add fresh ground pepper and juice 2 limes on top of the pork and shrimp. Continue stirring the ingredients. To serve, you can wash your lettuce leaves and/or quarter some colored bell peppers. I love love love this with bell peppers. Try it! 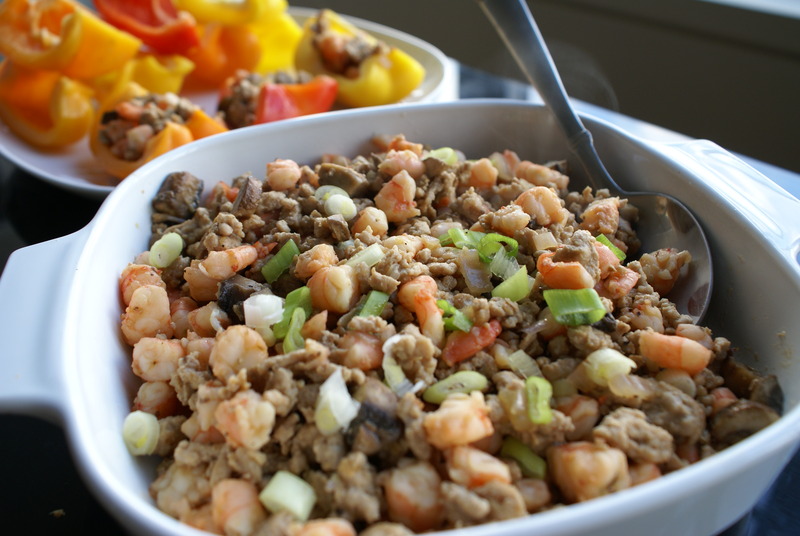 Once the pork and shrimp are fully cooked, add the green onions as a garnish. Serve and enjoy! For those of you who know what Korean Jap Chae is, this dish is right up your alley. It doesn’t taste EXACTLY like Jap Chae because I’m not using real starch noodles. 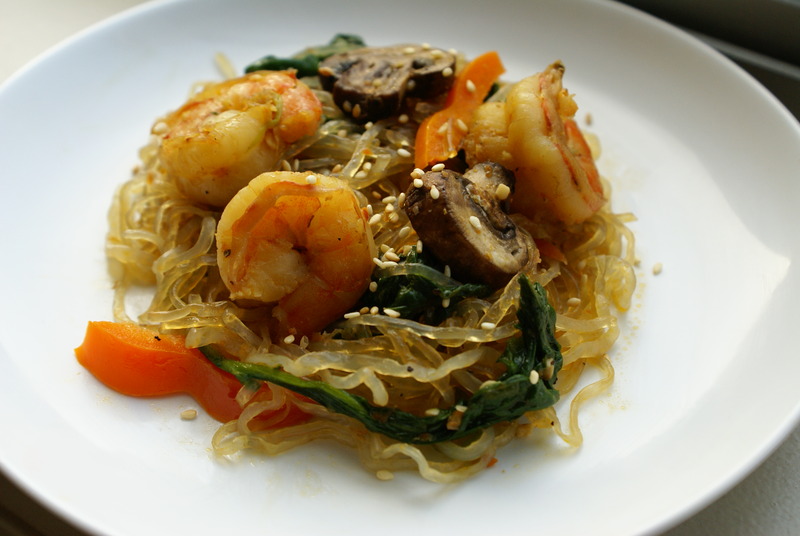 To remain paleo, I use kelp noodles instead of clear glass noodles. This dish is a great way to add protein and veggies while getting that noodle texture you may crave. As I’ve said before, for those of you who haven’t tried it yet, kelp noodles look just like clear glass noodles but with the initial texture of seaweed (i.e., slightly rubbery and chewy). It is made only of kelp (a sea vegetable), salt extracted from brown seaweed, and water. You could eat it straight from the packaging after washing the noodles under water but I prefer to heat up the noodles and add a variety of sauces. The great thing about kelp noodles is that they are extremely low in carbohydrates and calories while providing calcium and iron. This dish is completely flexible and entirely delicious. Feel free to add different meats, different veggies, etc. Finding paleo substitutes is like hearing a great cover to one of your favorite songs. It’s may not be as good as the original, but it could exceed your expectations in other ways. Like my favorite cover to Hey Jude (hat tip Rebecca). How can you not love that little Korean boy!?!? Fill a large pot with water and boil. When water is boiling, add the kelp noodles and cook on medium/high heat for 15 minutes. In a large saute pan, add the sesame oil and shrimp on high heat and stir. After a couple of minutes when the shrimp gets a light pink color and nearly finished cooking, add the remainder of ingredients (except the sesame seeds) and change heat setting to medium. Constantly stir the spinach and mushrooms until they have wilted and browned, respectively. Then add the kelp noodles and sesame seeds. Continually stir for several minutes until the kelp noodles have absorbed the flavors in the saute pan and turn a nice light golden color. Today was one of those days that I just had a bunch of random things in the refrigerator. Ground pork, swiss chard greens, some peaches and random spices in the kitchen. Nothing really that exciting but when you put them all together – pretty darn fantastic. Oh and speaking of fantastic – check out this amazing 2010 CrossFit Games highlights video (hat tip Brook). The song is so unbelievable and a perfect compliment to the video – just like peaches to pork. This recipe might not help me get a muscle-up or a ring handstand push-up but at least it’s paleo! For the chutney, dice the peach and pineapple chunks. In a sauce pan – add the chopped peaches and pineapple on medium heat. After 4-5 minutes of stirring in the pan, add the orange juice and sriracha sauce (this is optional – I’m asian and grew up with this stuff so I add it to nearly everything to get a bit of a spicy kick to my dishes). After 5 minutes of sauteing, place the chutney in a bowl and set aside. In a large bowl, hand mix the ground pork with the cumin, sage, garlic powder and salt and pepper. After the seasonings are thoroughly mixed, make 4 patties. Place the patties in a hot sautee pan and cook on each side for 4-5 minutes for a medium finish (or less depending on how you like your meat cooked). While the burgers are cooking, wash and dry your swiss chard. (You can use any leafy green but I happened to have an extra bunch from my weekly CSA). 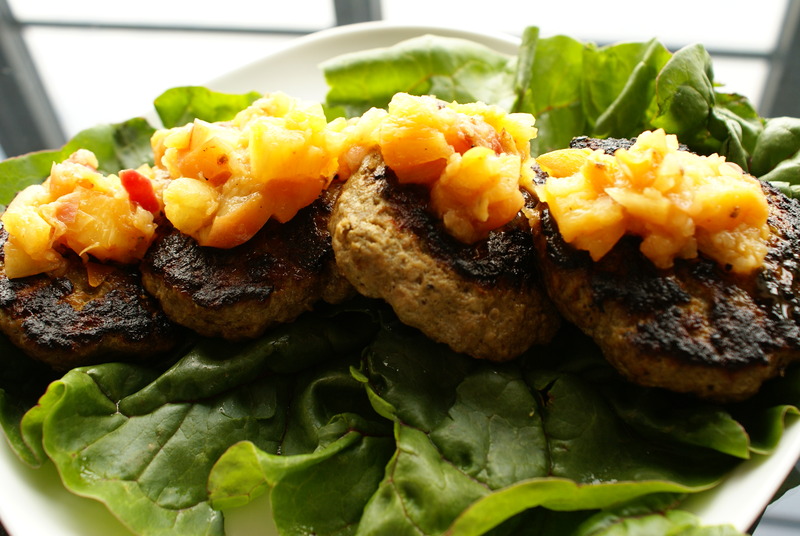 Once the pork burgers are cooked – add the chutney on top of each burger and use lettuce as the wrap. Best served immediately. Serve and enjoy! I used to be a fast food junkie. I knew fun facts about McDonald’s and Burger King and Taco Bell and Jack in the Box and Arby’s (I could go on and on). Occasionally I would go to these fast food chain’s websites to check out the latest product offerings. Ok – who am I kidding – I still go fairly often. The latest fast food craze to hit the market was KFC’s Double Down that was introduced on April 12th. I thought it was a GENIUS move in fast food marketing. When you think about it – KFC effectively made a ‘healthier’ item by removing the buttery biscuits that accompany many of their sandwiches. But somehow people think the Double Down is even more gluttonous (great work with the aggressive advertising campaign and close-up pictures I must say). This positive buzz encouraged KFC to extend the sandwich on it’s menu as the Double Down offering was scheduled to end on May 23rd – six weeks after their initial launch. Now for you meat lovers out there, it will be available indefinitely until customers’ interest wane. If you remove the cheese/sauce – the grilled Double Down is actually a great paleo option with bacon strips flanked by two grilled chicken breasts! 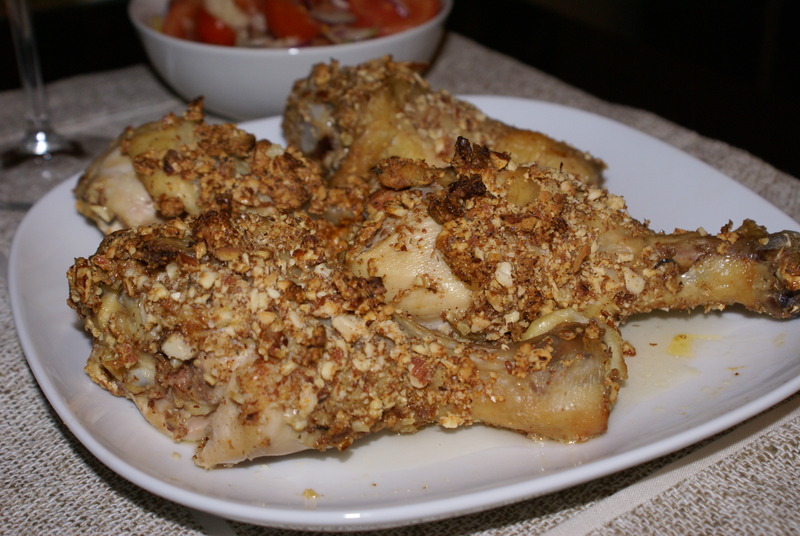 But for those of you who have been missing deliciously battered and buttered fried chicken and find themselves wiping away drool as they drive past KFC – try this paleo recipe. You can fry the chicken as well, but I thought to make it a bit healthier by baking it in the oven. The almonds and pistachios give a nice crunch so that you don’t miss the fried batter texture (as much). Enjoy! It’s easier to make an assembly line to make this recipe. The first station is the flour mixture so combine the almond flour, chopped pistachios, paprika, herbs and salt and pepper. The second station is the eggs so scramble the eggs and set aside. Third station is a foil-lined oven tray that you’ll put in the oven. Take a paper towl and pat dry the chicken (this helps the batter stick better). Then dip each piece of chicken into the flour mixture first. I find that it keeps the chicken more crispy if you coat with the flour first (versus the egg). Once each chicken piece has been coated initially, mix the eggs with the remaining flour batter. Re-dip each piece of chicken in the new mixture. Place on the foil-lined tray. Once you have finished coating all of the chicken, sprinkle any remaining flour mixture on to the chicken. Bake for 35-40 minutes or until chicken is 165 degrees (as with all of your poultry). Enjoy! I grew up with an incredible amount of noodle soup so they definitely fall on my list of comfort foods. Being asian – it wouldn’t be out of the ordinary if my family had noodle soup for breakfast, lunch and dinner (and mid-day snacks) on some days. One of the hardest parts for me of sticking to a paleo diet was giving up rice, noodles and every grain derivative in between. But my paleo food challenge was made easier after I discovered kelp noodles which are made of kelp (a sea vegetable), salt extracted from brown seaweed, and water. They taste a bit rubbery (like seaweed) if you eat them straight from the bag but if you soak them in a broth or sauce for 10-15+ minutes, they will soften nicely (while also absorbing all flavors) and has the same texture of cellophane – clear glass – noodles! This recipe looks a bit daunting given the long list of ingredients. But I promise – the actual ‘cooking’ is a breeze and the taste is so savory it’s worth it! This is my favorite paleo recipe so far. Even my husband, who doesn’t love asian noodle soups, gave it a huge thumbs up and said it was so good he felt like he was cheating on paleo. I cannot wait to make this for my Vietnamese mother who continues to give me the stink eye when I tell her that the paleo diet doesn’t allow for rice or noodles. I’ll wait until after she finishes a third bowl of this soup to let her know that it’s a paleo-friendly meal. In a large pot, bring the chicken broth to a boil. Reduce heat to medium and add all of the broth ingredients EXCEPT the star anise, kelp noodles, spinach and cabbage. Stir lightly. After 5 minutes, drop in one star anise. This is my favorite secret ingredient for soup broth and reminds me so much of my childhood. For those of you who aren’t familiar, star anise (aka illicium verum) is a native plant of Asia. My momma always said that star anise helps aid digestion and promotes vitality and vigor in the human system. It also gives the most savory and complex flavor when added to soups (if you have ever had Vietnamese Pho Noodle soup – it is a star ingredient in that broth as well). Just remember to use sparingly – one star anise will go a long way. Once all of the other broth ingredients are together, wash your kelp noodles and add to the soup. Leave on medium heat, stirring occasionally. For the dumplings, combine the ground pork and ground shrimp with one egg, minced ginger, salt and pepper. Hand mix thoroughly. Take a large spoon and simply scoop out a dumpling size ball and place in the broth. That’s it! Once you spoon all of the shrimp/pork dumplings and add it to the broth, cover the pot and lower heat to low/medium. The dumplings will cook fairly quickly but it’s nice to let all of the flavors blend together. Stir occasionally. 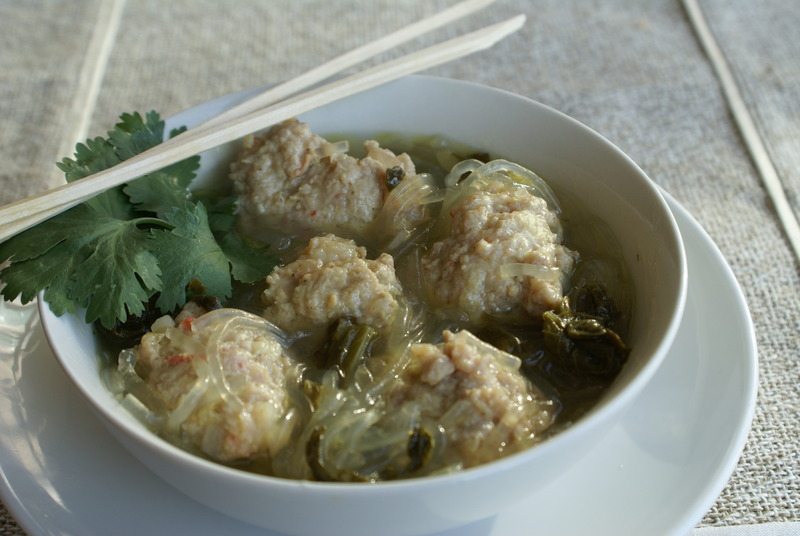 About 5-10 minutes before serving, add the spinach and napa cabbage since they cook instantly in the broth and you want the cabbage to have a little bit of crunch when you eat it. Feel free to add any vegetables you want – I just happened to have a ton of cabbage and spinach from my CSA’s weekly harvest. Serve and enjoy! This could be served immediately or you can freeze the broth and re-heat whenever you want. I haven’t watched the MTV awards (music or movie) in a very long time. Maybe 5 years, maybe 10? But I must say, the 2010 MTV Movie Awards was good. In fact, it was pre-tty, pre-tty, pre-ttyyyy good. It had an amazing opening with the return of Les Grossman and it also had a scene of Ken Jeong wearing a one-piece leopard man-thong gyrating next to a piano which segued into Tom Cruise holding his own in a dance sequence with J-Lo. But the best part of the movie awards – hands down – was host Aziz Ansari. His Taavon impression of reading a magazine with swag made me laugh so hard I thought I gave myself an ulcer. And when I thought he couldn’t get better, Aziz ended the awards show with a hysterical R.Kelly Pied Piper-inspired tribute to Avatar. I have a feeling MTV will play reruns of the awards show about 4,000 times before summer ends so I would highly encourage you to catch parts of it if you want a good chuckle (or just click on those links). There’s nothing more memorable to me than a hard laugh …well maybe a really great meal. 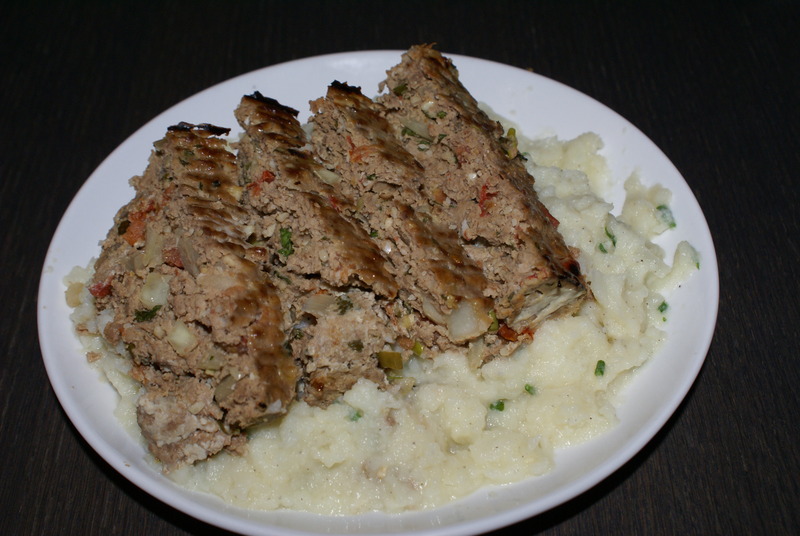 Speaking of great meals – try this hearty paleo meatloaf dish. In the meatloaf, I substituted bread crumbs with almond flour. For those of you missing mashed potatoes – cauliflower will give you the same creamy texture. It won’t taste starchy like mashed potatoes but we both know it shouldn’t anyways. I hope you enjoy this recipe half as much as I enjoyed seeing Zach Galifianakis doing the “I don’t know” dance during his Swagga Dance session. To make the meatloaf – combine all of the meatloaf ingredients together in a large bowl and hand mix thoroughly. Pour in a greased 1.5 loaf pan and place in oven. Bake for one hour. Best served immediately. To make the mashed cauliflower – chop one head of cauliflower into 1-2 inch pieces. Steam the cauliflower and garlic over boiling water until tender (about 15 minutes). Then – mash the cauliflower and garlic up to the consistency you desire. I like it creamy so I just place the cauliflower in a small blender until it’s nice and smooth. If you want it with a bit more texture, just mash the tender cauliflower with a fork. Once you’re at the consistency you desire, add in olive oil and chives (with some salt and pepper to taste). Best served immediately. For those of you wanting some protein and not interested in heavy cooking after a workout – this dish should be added to your lineup. This is one of the easiest recipes ever. It’s so easy even my caveman husband could cook it. ABC. Easy as 123. Rinse mussels under cold water, scrubbing away dirt or strings (beard) on the mussels. Throw out any mussels that are cracked or broken. In a large pot, combine the wine, shallots, garlic, salt, parsley and thyme on medium heat for five minutes until the shallots soften. Add mussels and cover the pot, increasing the heat to high. 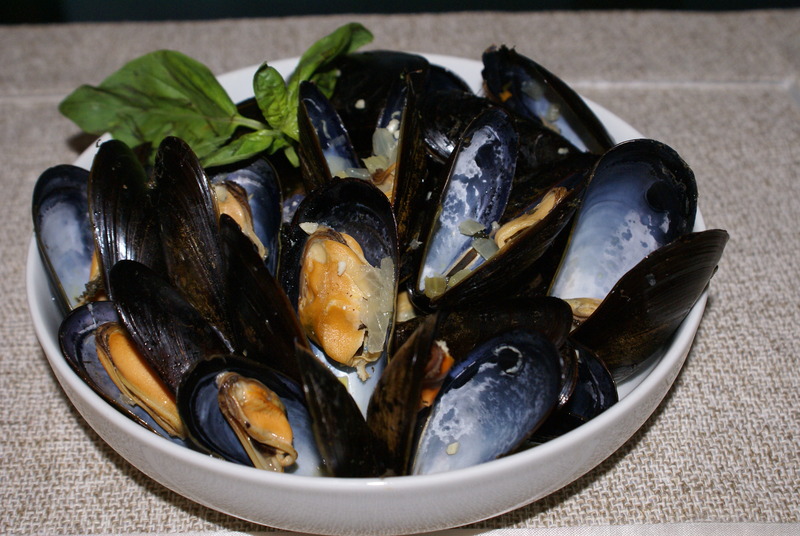 Mussels cook very quickly so after five minutes, they should be ready. You will see each of them open up with the mussel meat looking juicy and tender. Throw out any mussel that does not open up. Serve immediately and enjoy! 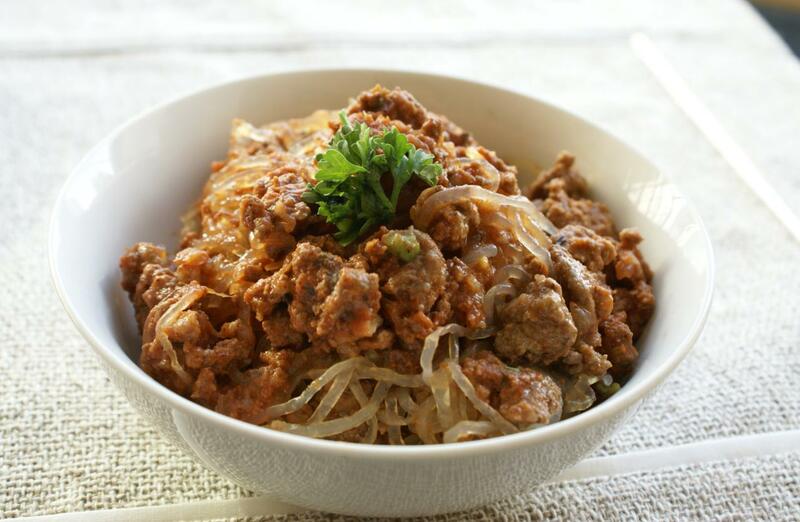 During the 7 week paleo food challenge, I neglected some of my closest friends: spaghetti carbonara, spaghetti marinara and my ultimate BFF – spaghetti bolognese. To get that noodle texture fix I was craving, I tried numerous spaghetti squash recipes but none of them felt right and all left me wanting to run to the nearest Mario Batali restaurant to stuff my face with the real deal. Fortunately, with the magic of the world wide web (thanks Al Gore), I found kelp noodles. For those of you who haven’t tried it yet, kelp noodles look just like clear glass noodles but with the initial texture of seaweed (i.e., slightly rubbery and chewy). It is made only of kelp (a sea vegetable), salt extracted from brown seaweed, and water. You could eat it straight from the packaging after washing the noodles under water but I prefer to heat up the noodles and add a variety of sauces. The great thing about kelp noodles is that they are extremely low in carbohydrates and calories while providing calcium and iron. Kelp noodles will never be the perfect substitute for pasta, nor will you see it in the next version of Lady and the Tramp. But for those wanting the paleo next best thing to spaghetti, I think you’ll really enjoy this dish. In a dutch oven (insert joke here), saute the garlic, parsley and onion in extra virgin olive oil and stir on high heat until nicely golden. Add the ground beef, salt and pepper, and cook on high heat. Make sure to constantly stir the meat so it breaks nicely and you don’t have large chunks of meat. We’re making bolognese sauce here – not meatballs. Once the ground beef is nice and brown, add the tomato sauce, parsley, oregano, rosemary and red pepper flakes. Stir the mixture so that all of the ground beef and tomato sauce are evenly mixed. Taste and correct seasonings (add salt and/or pepper if needed). Lower heat and let simmer for an hour. (This is usually when I just put the dutch oven in a slow cooker on low heat, run out the door to grab a CrossFit WOD, and come back to a nice warm meal). After an hour, the bolognese sauce should be meaty and delicious with a slightly sweet taste from the sauteed onions and have a little kick from the red pepper flakes. Open 2 bags of kelp noodles and quickly rinse with water. Add the noodles into the meat sauce and stir until the noodles are evenly coated. Allow for the noodles to absorb the sauce for 15 minutes on low heat. Best served hot and immediately. For those Lacto-Paleos out there, feel free to top with grated Parmesan or Romano cheese.